The opening of 14th Street was the advent of the New York style Pizza in Karachi - basically pizza that is large, wide, thin, and foldable with a crispy base. Not that Pizza Hut or Domino's didn't offer thin crust pizza but it just didn't become as popular as when it was started by 14th street. Obviously, once the concept become popular, lots of other Pizza places started opening with some hits & misses. So far, the biggest hit in the concept (at least for me)is well, New York Pizza (quite aptly titled). I have to credit the discovery to my cousin since she was the one who made me order and I am so glad I did. 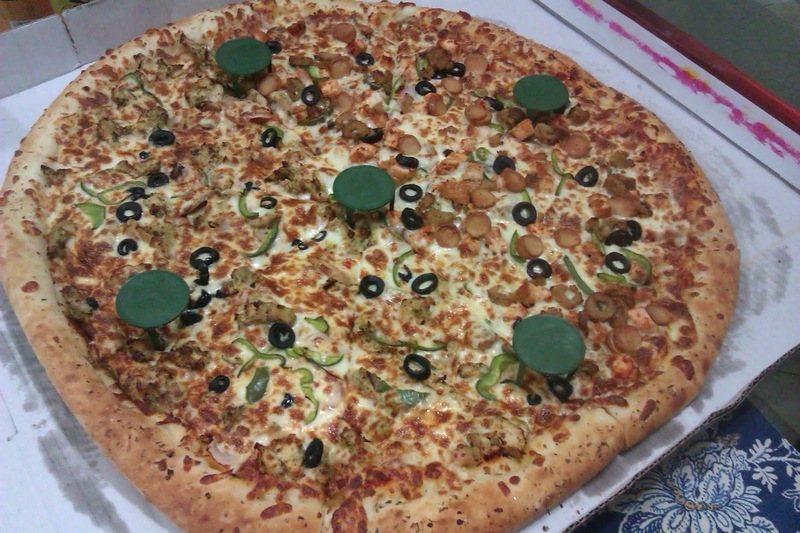 The Pizza was huge (it's 21 inches so the biggest in Karachi) & delivered , piled high with delicious toppings (as you can notice) and it was delivered very hot right on time. Going into detail - first of all, their service was really great - the order taker helped me out in explaining the menu properly & he didn't get irritated when I made him hold for a minute just to confirm the order with the rest of the family. While ordering you first need to decide on the type of Pizza (New York Style or traditional) Size (for New York Style its a slice, half a pizza or full 21 inch pizza), then the topping (ordered the full pizza so had the option of choosing two flavors - choose New York Special & Chicken Fajita), then the sauce (its either Mild, Hot & Extra Hot - but its the same sauce for the entire pizza) then the vegetables (you have an option of choosing whichever vegetables you want with your preferred flavor) and then sidelines. I had gone for Combo 4 which was 21 inch Pizza and 1.5 litre drink for Rs. 1749 and it was more than enough for 4-5 people (5 girls with 1.5 slices each). Moving on to the Pizza itself - it came before the stipulated time - their delivery service is quite good because it has so far been delivered either on time or before. It was delivered quite hot and we just started eating the moment it came. Everyone loved the pizza especially the generous amounts of topping. The crust was thin & crisp and yet soft otherwise it feels like you are eating hard bread. What I found really delicious was that they stuff this white sauce or maybe cheese sauce in the edge of the crust. I don't particularly enjoy the edge of the pizza because it just tastes of bread and but this stuffed sauce made the end part really flavorsome. The entire family found the New York Special better than the Chicken Fajita - had more flavor and different kinds of smoked meat. Additionally they serve it with garlic butter and red chilli flakes. All in all, a good experience leading New York Pizza to be so far, my preferred delivery place for Pizza.